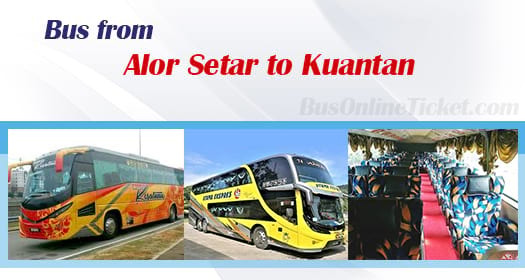 Bus from Alor Setar to Kuantan is one of the most convenient way travelling from Alor Setar to Kuantan. Kuantan is known to the tourists for its waterfalls and beaches. Therefore, many locals and tourists like to visit Kuantan for the beaches and waterfalls during holiday season to relax their mind. Kesatuan Express and Utama Express, are two bus operators supply bus from Alor Setar to Kuantan. Each of the bus operator provides 1 daily trips. Both operators are operating the route with VIP seating coach. The only difference is that Utama Express deploys Double Deck VIP coach while Kesatuan Express deploys single deck VIP coach. Please note that there are no trips available during afternoon session. The morning bus goes at 8:45am. The evening bus schedules is at 8:30pm. The travel time from Alor Setar to Kuantan is takes approximately about 10 hours depending on the road traffic condition. As for the long-distance journey, all the passengers will be given at least one stopover along the highway. Additional washroom break will be provided upon request from the bus driver during the journey. The bus ticket price from Alor Setar to Kuantan is costs in a range of RM 63.00 to RM 63.90 depending on your selection of bus service provider. The bus driver will pick up passengers at Alor Setar Bus Terminal. After that, the bus driver will drop off all the passengers at Kuantan Sentral Bus Terminal. With limited departures time from Alor Setar to Kuantan, passengers are encouraged to book their bus ticket online in advance to avoid any disappointment. You can always book your bus ticket online via BusOnlineTicket.com by using any electronic devices with internet access. Instant confirmation email will be sent to your registered email upon payment is successfully been made.